We Offering you a complete choice of products which include Bed Side Rail Clamp such as Bed Rail Clamp, Single Safety Rail and Bed Side Rail. 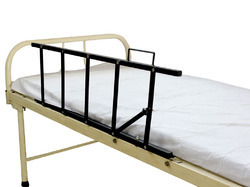 Clients can avail high-quality Bed Side Rail from us, which are available in varied specifications and at most affordable rates in the market. These rails are designed in compliance with the industry standards and norms. These can be fixed alongside your bed that prevents the falling from bed. Their collapsing mechanism provides lowering the rail for easier up down of the bed. Owing to their unmatched quality, These are known for their easy installation and lightweight.